The Easterbrook family’s history in local agriculture goes back over 100 years to 1906 when the Easterbrook family ancestors settled in Richmond, BC and established the first grain mill east of Ontario. The mill was located at the corner of No. 3 Road and Bridgeport on the banks of the Fraser River The mill produced flour for human consumption as well as serving Richmond’s pioneer farms with grain and seed for animal feed, dairy cows and field crops. Ninety two years later, on a Richmond BC farm just 5 miles away from the original mill, Steve and Lynn Easterbrook founded Rabbit River Farms and set another milestone in Canadian agriculture by becoming the first producers of organic eggs in Canada. Being a pioneer is never easy, and as you’ll see clearly in the Rabbit River Farms story, the Easterbrook family had to overcome many obstacles on their path to becoming what they are today – a successful, ethically run, organic egg producer and grader that supplies eggs to thousands of people every day through hundreds of grocery stores, bakeries and farmer’s markets. Rabbit River Farms is living proof that it’s possible to have a truly sustainable food system which focuses on animal welfare, and balances society’s need for reasonably-priced food with animal comfort and well-being. Steve Easterbrook’s passion for birds and appreciation of animal behaviour began in his childhood where he spent his free time observing and caring for livestock. Growing up in the mid 1960’s, Steve was fortunate to have been raised in a neighbourhood that included a free-range egg farm, and to be surrounded by retired farmers who tilled organic backyard gardens. 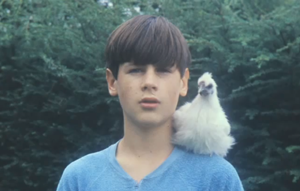 He was barely 10 years old when he and his best friend set up their own chicken coops and bird aviary learning how to care for guinea fowl, peacocks, homing pigeons, ducks and many heritage breeds of chickens to emulate what they saw the farmers doing. Steve and his friend had never heard of confining birds in small cages and this early principle of free ranging chickens seemed the obvious choice years later when he began to produce organic free range eggs under the Rabbit River Farms brand. Although organic eggs are a fast growing trend today, back in 1992, the idea to produce organic chicken eggs was unheard of and the standards of doing so were defined by nothing more than two short lines in the California Certified Organic Farm Act. Steve and Lynn Easterbrook, however, had just bought their acreage in Richmond and were interested in organic produce. Happening across a company called Pro Organics, Steve was stunned to learn that the type of organic produce the consumers really wanted and couldn’t find anywhere in Canada was organic chicken eggs. Steve describes hearing this as his “light bulb” moment, and you might say this is the moment the concept of Rabbit River Farms was hatched. Steve researched organic certifiers of chicken eggs and found there was very little in the way of defined standards. He contacted the BC Association for Regenerative Agriculture (BCARA) and through discussions with them, Steve learned of the need for organic egg standards and agreed to collaborate with the Board to help write them. The first flock of 260 organic, free-range chickens was purchased while Steve was hand building that first 24×16 foot chicken coop in the yard. Unfortunately it wasn’t the smoothest move-in – neither for the flock nor for Steve. Since the chicken coop wasn’t quite finished when the birds arrived, Steve recalls moving each of the hens by hand up a ladder to the safety of the loft that first evening. Looking back, it might have been a sign of the painstaking care and effort that would be needed to pioneer a new way of producing eggs in the highly regulated environment of the BC Egg Marketing Board. In those early years, Steve documented his learning and helped write the first Canadian organic egg production standards that were adopted by the Certified Organic Association of BC (COABC) which, at the time, was the only government- approved body responsible for overseeing the BC Certified Organic Program. Being a family affair, Steve enlisted the help of Granny Jan (Lynn’s mom) to help care for the hens and collect the eggs. Each carton of eggs at the time met the new high standards for quality, sustainability and ethical treatment of animals that Steve helped author in the new standards. Rabbit River Farms’ first batches of organic eggs were hand collected, individually inspected for quality and hand stamped with the Rabbit River Farms seal. Steve and Lynn knew they were on the right path, as the local health food store, Circling Dawn Organic Foods (BC’s original “all organic” food store located on Commercial Drive), had no trouble selling as many cartons of organic eggs as Rabbit River Farms could supply. 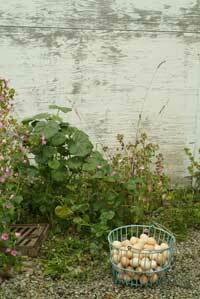 Rabbit River Farms’ early days of experimentation with organic egg production was soon noticed by the Egg Marketing Board of BC. The regulations of the EMB are defined by a quota system that was designed in 1967 to control the production of agricultural products. By controlling and stabilizing the amount of eggs produced each year, the theory of “Supply Management” is that rising prices of agricultural products one year would not lead to overproduction and a sudden drop in prices the following year. In short, the quota system was designed to help avoid boom and bust cycles for farmers and inconsistent supply for consumers. Though it made sense in principle, the quota system had inadvertently become a major restriction for innovations in egg production and new ways of thinking in the egg industry. Since there was no quota available to be purchased, the only way for Rabbit River Farms to get quota was if a farmer holding quota retired and sold their share. The price of quota was also so high that for small scale farmers it would not have been financially viable to purchase. The BCEMB arranged their first inspection of Rabbit River Farms. Since Rabbit River Farms was operating without the required quota, the visit had the potential for conflict. Steve recalls however, being surprised that one of the inspectors was very complimentary of the farm, commenting how nice it was to see the chickens roaming freely – something they had never seen before given that the whole egg industry had evolved to caged egg production. A heartfelt moment with the inspector didn’t negate the reality of the quota regulations however, and Rabbit River Farms was given dire options: get quota; cease operations; or have the hens seized. Weeks later the BCEMB called to ask Steve if he had seen the seizure notices which had been stapled around the chicken coops days before. Ironically Steve had truly not seen the notices, since the free ranging chickens had pecked and eaten the paper – all that remained were the staples on the outside wall of the barn. The BCEMB was clearly in new territory with Rabbit River Farms, and the egg regulating organization needed to re-think its operations. Despite a huge difference of opinion with the BCEMB in regard to fair requirements for new egg producers adapting to changing consumer demands, amazingly, and with a great deal of fortitude and perseverance, Rabbit River Farms was never shut down and its chickens were never seized! For awhile the only thing stopping this from happening was Steve’s discovery of a Supreme Court decision that had created a small loophole in the Natural Products Marketing Act of BC. After Rabbit River Farms convinced the BCEMB of the need to evolve and accept the need for cage free production and specifically certified organic egg production in BC, a small group of family farms began producing organic eggs under the standards that Steve developed. Responding to Steve and other organic egg producers’ ongoing lobbying, the BC Ministry of Agriculture commissioned a study now referred to as the Laroux Report. The report recommendations were to grandfather the existing (pioneering organic egg producers) into a special class of “Specialty Egg” quota that would allow them to produce and advance organic egg supply in BC and eventually across Canada. The original group of local BC founding organic family farm egg producers continue to ship to the Rabbit River Farms grading station to this day. Additionally, Rabbit River Farms continues to enlist and assist new “Specialty Egg” farmers into the cage free egg production market. Rabbit River Farms has grown its market by educating, enabling and providing a market channel for small scale, local family farms. It took Steve Easterbrook 16 years of trail blazing, lobbying and educating the Provincial Ministry of Agriculture and BC Farm Industry Review Board as well as advocating and rallying consumer support before his vision of an equitable New Entrant program for egg producers was finally adopted by the BCEMB in 2010. The New Entrant program was designed around Steve’s recommendations to enable new small family farms to begin producing what the BCEMB classified as “Specialty Eggs”. 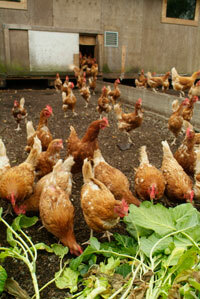 In 2010, four new organic egg producers in BC where granted quota of 3000 hens each, and in 2011, another six were added. The program is now ongoing annually and has spread to other provinces with progressive Egg Marketing Boards (currently Saskatchewan, Manitoba and Quebec). In recognition for his contribution to advancing sustainable agriculture and enabling easier access to new egg farming families Rabbit River Farms received the BC Ethics in Action award in 2001. When Rabbit River Farms began its operations in 1992 the cage free population of hens in Canada amounted to a few thousand back yard hens. Today there are an estimated 400,000 cage free hens in BC and growing. 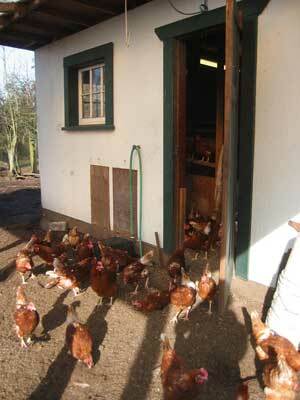 Additionally, BC’s cage [The old chicken coop.] 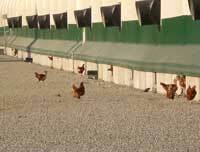 free movement has rippled across other provinces resulting in over 1,000,000 cage free hens in Canada. Ongoing public awareness and demand for organic and other cage free eggs has created an ongoing momentum of transition from cages to more humane farming. 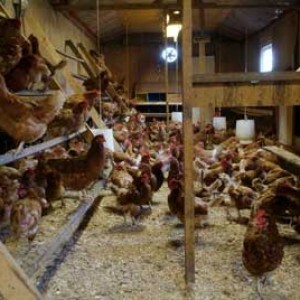 Steve is pleased to see the Canadian egg farming industry returning full circle to its traditional cage free heritage. working with the SPCA and BC Humane society to advance cage free egg production and participate in the development of improved humane farm animal standards for other livestock categories (Broilers, Sheep, Beef). As a pioneer in Cage-Free egg production, Steve’s love for the field remains strong but the demands of washing, candling and grading eggs for the Rabbit River Farms brand had grown beyond the capacity of their current grading station. It was time to transition that part of the business to a company who is better able to service the needs of our customers and support the growth of the brand. We’re pleased that Golden Valley Foods is now handling the grading, packing, sales and logistics of the Rabbit River Farms brand. After careful consideration we felt that Golden Valley, a local BC company, was the best choice to continue to grow and sustain the brand with their state of the art grading and logistics systems. Steve Easterbrook will focus on his core passion – the farming side – continuing to produce Rabbit River Farms brand eggs, spending more time with the hens and ensuring that the highest quality eggs and humane husbandry standards are maintained in all our Rabbit River Farms local flocks. Steve will continue to advocate Canada’s leadership role in Cage-Free egg production as well as give public tours on our family farm. We thank each of you for your past and continuing support. It is a pleasure to be producing healthy food while ensuring a good quality of life for our livestock and we look forward to seeing you all down on the farm.